IBARMIA has won the award in the Machine Tool category. In the Industry 4.0 category, the DANOBATGROUP has been the winner. MIZAR has received the award in Additive manufacturing. The AFM-SIF award to the best final year project has also been presented. 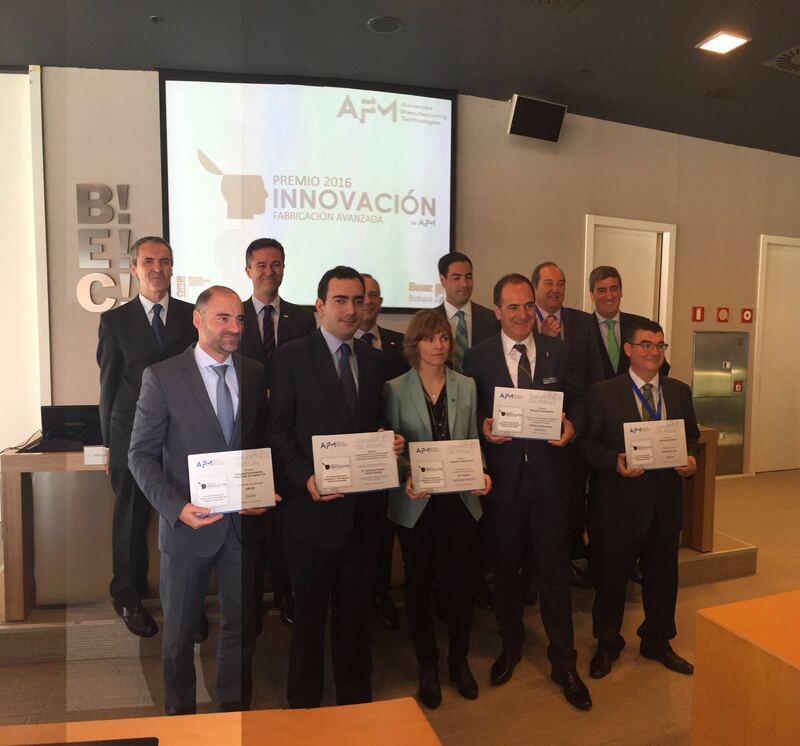 During the course of the Machine Tool Biennial, the National Award for Innovation in Advanced Manufacturing, organised by AFM, Advanced Manufacturing Technologies with the support of BEC and Beaz (Innovaton Agency of Vizcaya), was presented this morning at Bilbao Exhibition Centre (BEC). The President of AFM, Advanced Manufacturing Technologies, Antxon Lopez Usox and the Minister for Economic Promotion of the Regional Council of Vizcaya, Imanol Pradales, together with Xabier Basañez, Director General of BED, Andres Zabara, Director of Promotion and Cooperation of the CDTI, and Xabier Ortueta, Director General of BEC were entrusted with presenting the awards during this twelfth edition. The jury, comprised of SPRI, TECNUN, the University of the Basque Country, Mondragon Unibertsitatea, Ergogroup, Osalan, IHOBE, CDTI, BEAZ, and BIC GUIPUZCOA has considered criteria of technology, innovation, design, ergonomics, safety and sustainability to determine the awards. Furthermore, another award was also presented within the Innovation Awards, the AFM-SIF (Manufacturing Engineering Society) Award, which is the result of the close collaboration between AFM and SIF. This is AFM’s special mention to the best final year project related to the machine tool sector, and it has been granted to a Machine Tool student from the University of the Basque Country, Francisco Javier Llonin, for his project “Graphite tool for electro-erosion manufactured by the application of Laminated Object Manufacturing”. Ibarmia received the award for its universal machining centre with mobile column and head, and fork-type head, model THR16 Multiprocess, with respect to which the jury valued its integral design as well as the integration of ergonomics and corporate identity of the company. Noteworthy are its multi-process capacity, the design of the fork-type head and the robotised head changeover. The Danobatgroup was rewarded for its integral 4.0 project that addresses connectivity at three different levels: machine, process and factory. This is a compact design that seeks reliability and integration in machine, and the adaptation of the control to the operator in his daily work, unifying functions in a more functional interface. On its part, Mizar was rewarded for a bone repair plate that totally adapts to the patient’s anatomy, based on metal additive manufacturing carried out in collaboration with a arthroscopic surgery unit. In addition, ZAYER received a special mention from the jury for its ARION machining centre, which integrates intelligent tooling and sensor systems, exploiting big data.